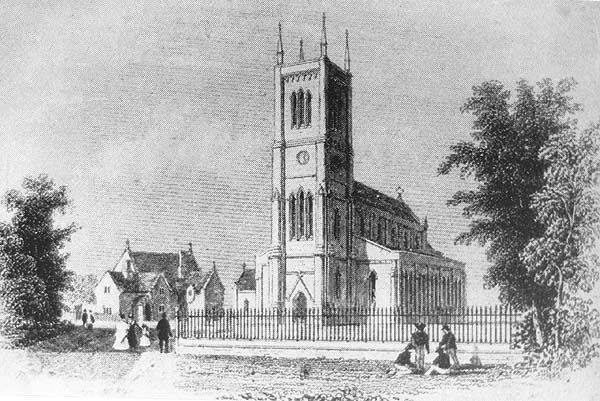 Holy Trinity Church viewed from the south shortly after it opened in 1842. The Mansfield branch railway line at the bottom of the graveyard has yet to be built. 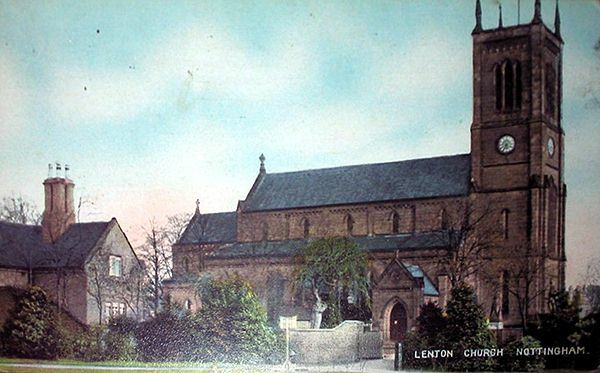 An early coloured picture postcard dating from the first decade of the twentieth century showing Holy Trinity Church, where the photographer was clearly standing in Lenton Recreation Ground when he took the shot. Probably take at much the same time as the previous photograph this picture postcard shows Holy Trinity Church viewed from the Church Street bridge over the railway line. This view of Holy Trinity Church is taken from an undated picture postcard published by 'Peveril'. 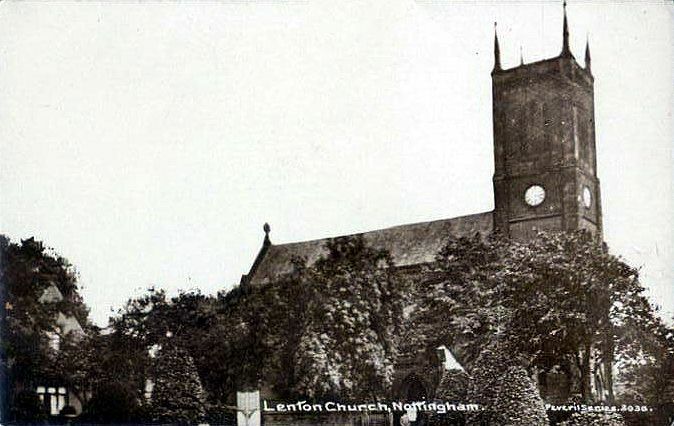 The photograph has been taken from Lenton Recreation Ground and features some tightly pruned bushes positioned in front of the wall dividing the park from the church school premises. 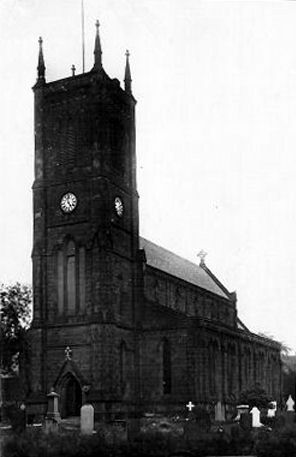 This photograph shows a view of Holy Trinity taken from the graveyard which originally featured on an undated picture postcard possibly published in the early 1920s. The southern aspect of Holy Trinity Church, taken from within the graveyard in August 2001. 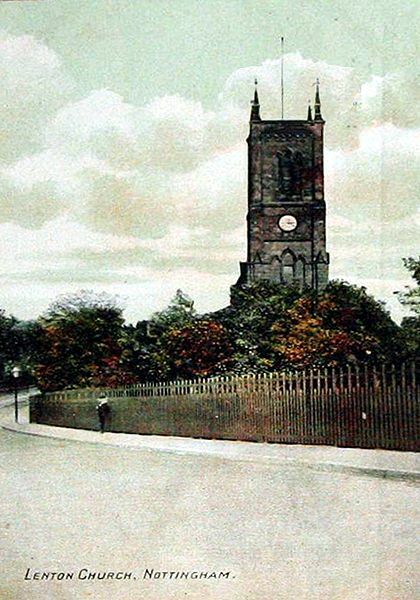 This early picture postcard of Holy Trinity Church, published by Peveril, shows the view of the church from Lenton Boulevard. The plot of land in the foreground would later be made into a tennis court (for the church) and later still would be sold off and the B.P. petrol station built on the site. More recently the petrol station site has undergone redevelopment and the 'new' shop units are now to be found here. 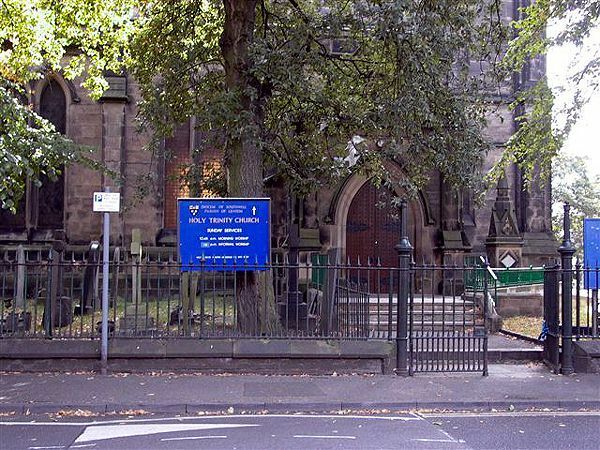 The entrance to Holy Trinity Church via the north porch taken from Church Street in August 2007. The entrance to Holy Trinity Church via the south porch also taken in August 2007. 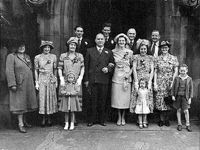 This is the doorway that is a regular feature in wedding photographs taken at the church see for instance the 1950 photograph of Thomas Bridgewater and Dorothy Waden shown below. 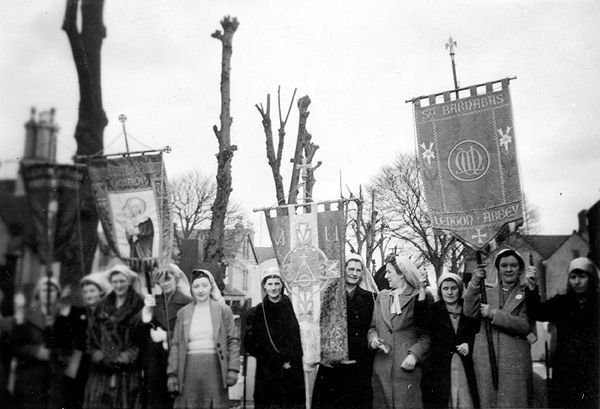 A gathering of the Lenton Mothers Union taken in 1947 drawn from Holy Trinity and its three daughter churches. The ladies with their banners are lined up on the pathway from Church Street leading up to the north porch. 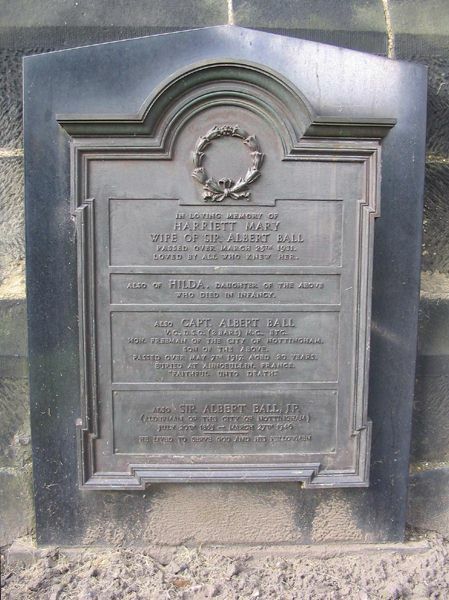 The Ball family plaque positioned on the exterior wall at the south west corner of the church. If you click here it will take you to the Albert Ball page where you can then access a larger version of the photograph enabling you to read exactly what is written. 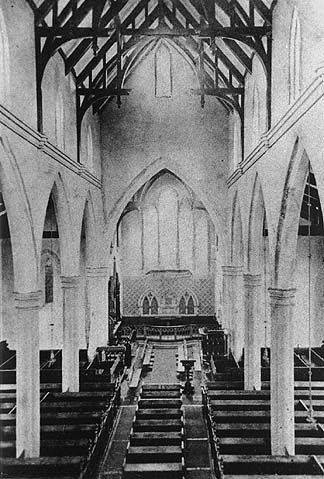 A view of the interior of Holy Trinity Church looking from the nave towards the chancel which was taken in the mid 1860s..
One of the glories of Holy Trinity Church is this Norman font which was once to be found in Lenton Priory. 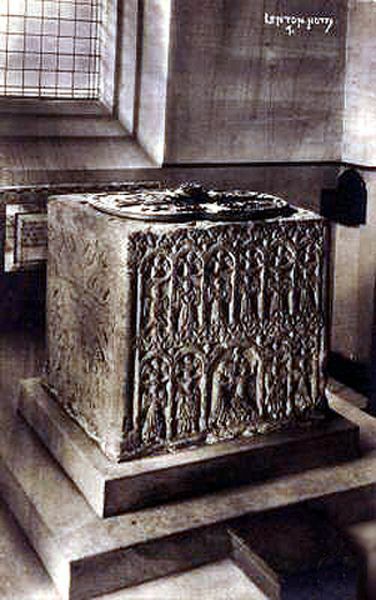 This and the next two images are taken from picture postcards of the font published in the late 1920s. Each of the cards shows a different face of the elaborately carved font. 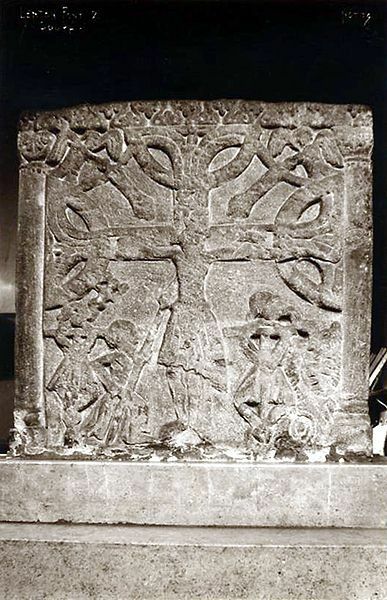 This one shows the Crucifixion with a Roman soldier piercing Christ's side with his spear as the soul of the penitent thief is consumed by a large dragon. This side of the font is divinded into four separate panels. 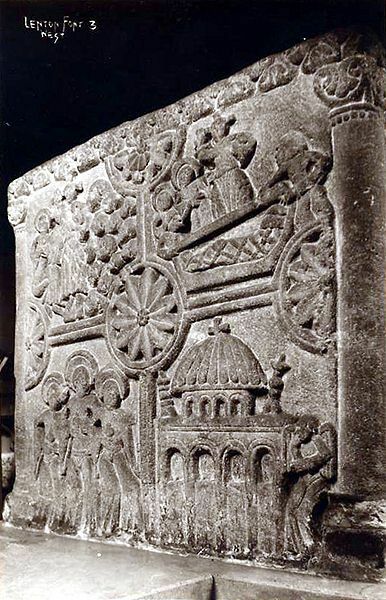 The top two feature the Resurrection of Christ while the bottom two depict the three Marys with a view of the Holy Sepulchre in Jerusalem on the right. 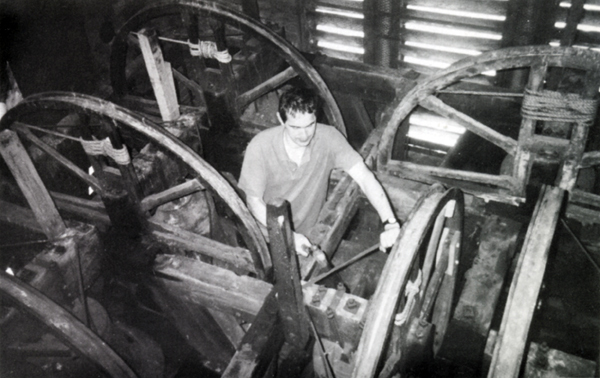 Robert Randle, one of the bell ringing team up in the belltower carrying out a few repairs in about 1995. 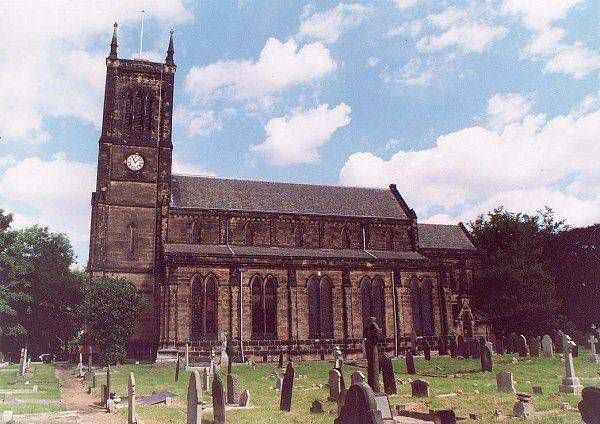 In the mid-1990s the Lenton bell ringers launched an appeal to raise the necessary money to permit a major refurbishment of the bells themselves and the bell tower. 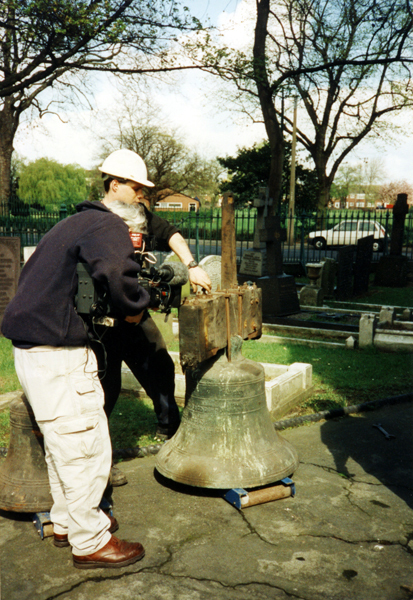 By 2001 enough money had been raised to get the project started and this photograph focuses on one of the bells that has now been removed from the bell tower. 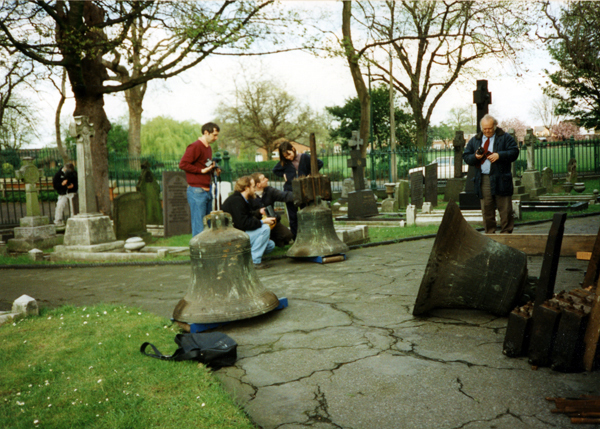 As you can see in this second photograph taken by Harold Lowe it involved taking quite a few bells out of the bell chamber - seven in all. 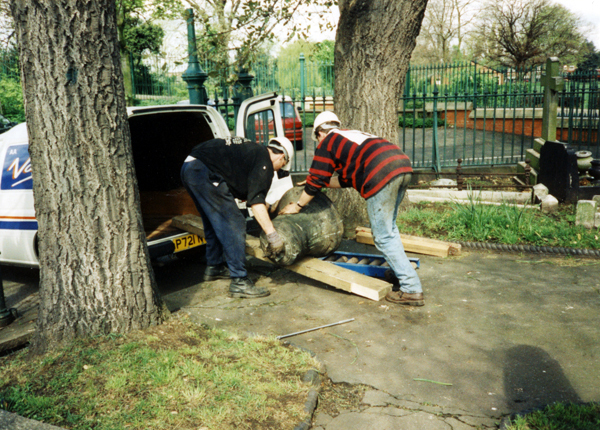 The bells were to be taken back to Loughborough where they would be retuned. While they were away a new steel frame work to support the bells would be erected in the bell tower. Too heavy to lift by hand the bells were rolled into the van up a makeshift ramp in order to be transported back to the bell foundry. One of the bells was too far gone to be repaired so a new bell was cast. 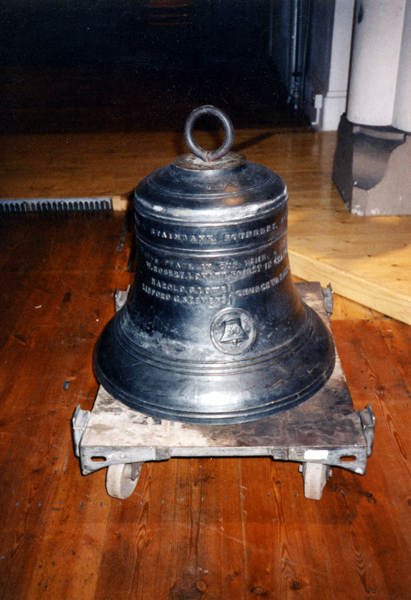 This is the new bell on its return to the church. Inscribed on it were the names of Robert Lovatt (priest in charge); Harold Lowe and Linford Stevens (the churchwardens). 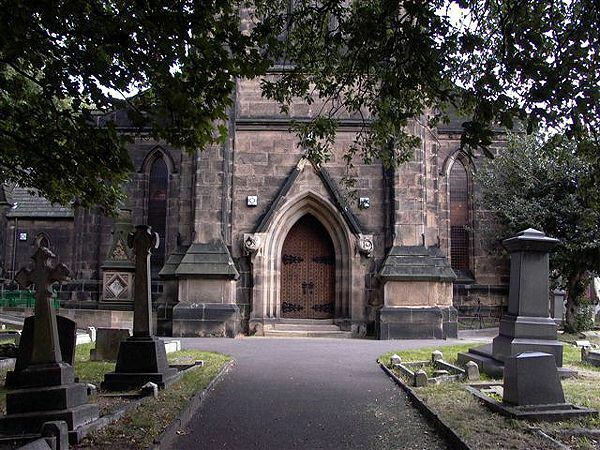 Lenton's parochial church council undertook a project that involved the construction of a new vicarage and the conversion of the original building into Unity House. The ground floor rooms could now be used for parochial affairs while the upstairs area was converted into several self-contained flats which helped finance the project. 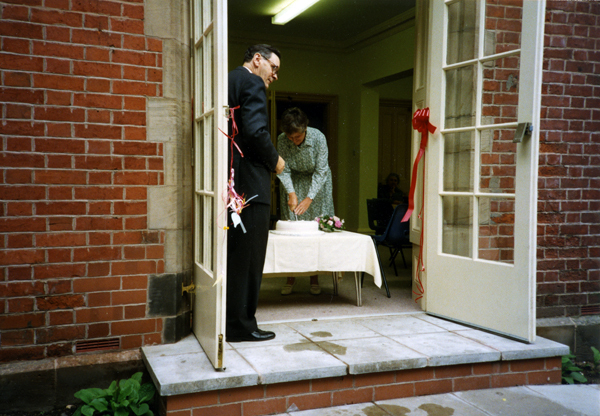 This photograph taken in 1992 shows the original vicarage after the building work had been completed. The official unveiling of Unity House took place on 18 July 1992. This view taken from the garden is looking through the new french windows. 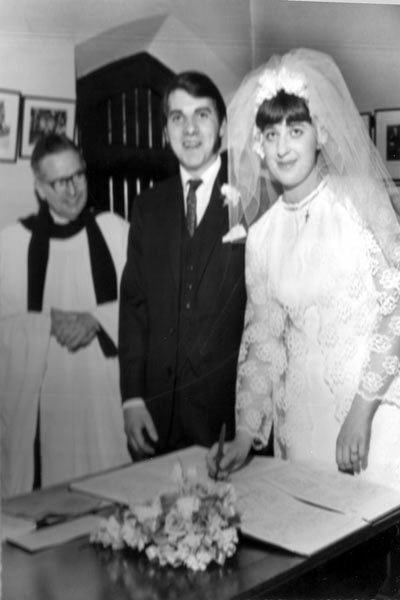 Standing beside the door is the Reverend Lloyd Scott, vicar of Lenton, with someone else cutting the celebratory cake. 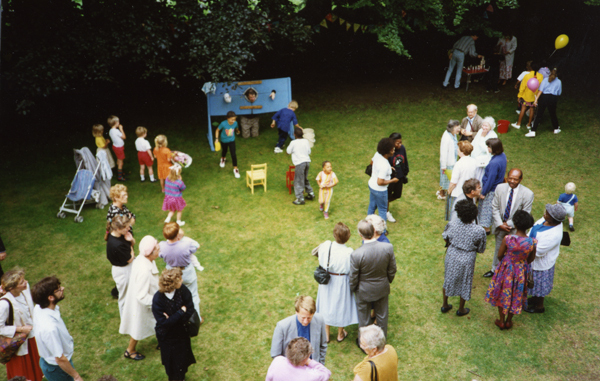 After the official opening the subsequent party spread out into the garden and Harold Lowe has gone upstairs into one of the new flats to take this view of what was happening in the garden. Members of Holy Trinity Church Youth Group pose for their picture on Sherwin Road before going on their Easter Hike in 1959. 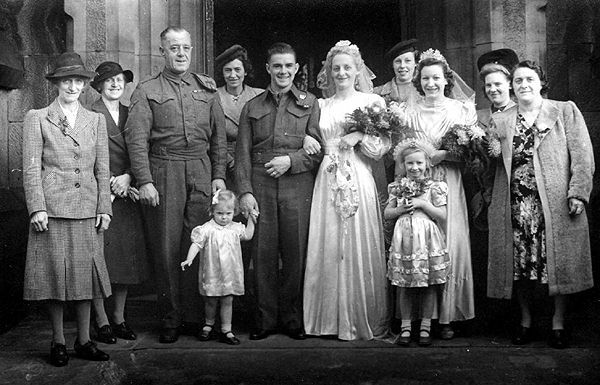 1943 wedding photograph of Margaret Felose and John Skinner taken at Holy Trinity, Lenton. 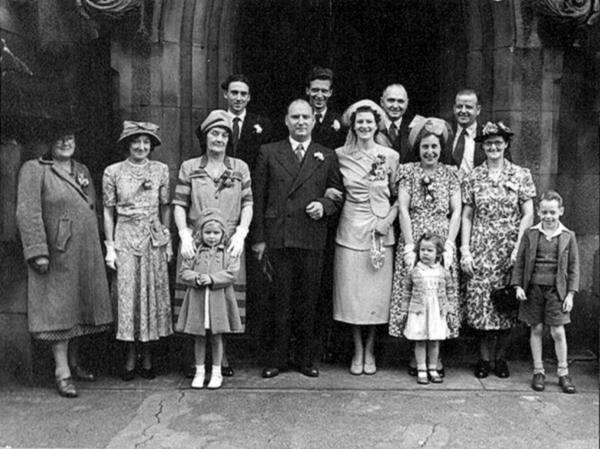 Photograph taken of the participants standing in front of the south porch at the September 1950 wedding of Thomas Edward Bridgewater and Dorothy May Waden. 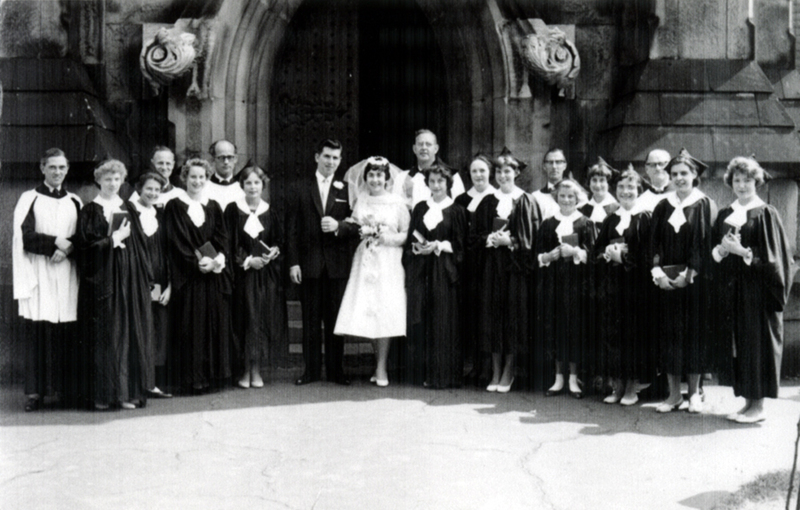 Pat Williams was a member of Lenton Church Choir so when she married at Lenton in 1960 it was appropriate to have a photograph taken with all her fellow choir members. 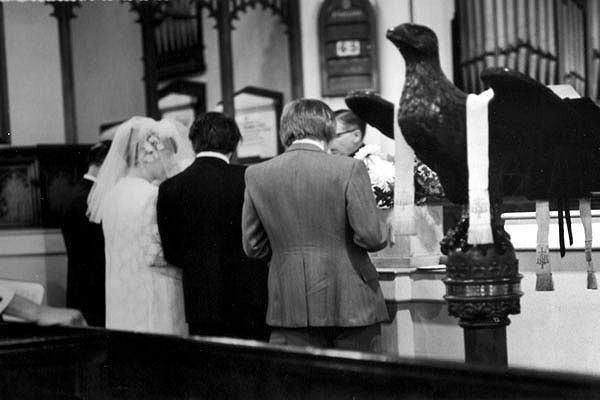 Inside Holy Trinity Church during the 1971 wedding of Christine Pawlina and Jeffrey Hill with Graham Hill, the best man, to their right. After the wedding ceremony Jeffrey Hill and Christine Pawlina moved into the vestry in order to sign the marriage register with the Rev. R.G. Dunford in attendance. 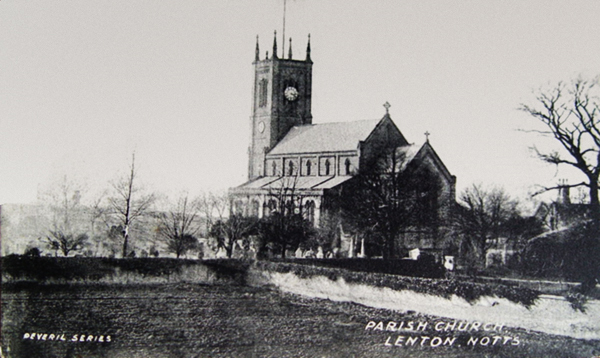 Do you have any historical information or other photographs of this church? If so, email us with the details or write to us.